The flights: No problems with flights to and from. Pool: Look nice but did not use. Food: Food was ok. Some days better then others. Rooms: Very nice, clean and modern. Don’t advise if you’re not comfortable with the person you’re rooming with. Not to much privacy. Would you return: Probably not but not for any particular reason. Personally would just want to check another resort out. How did you find our service? Excellent as usual! Any additional comments: Sorry this took so long to get back to you. We are back to reality. This trip started with us flying first class (only way to go). We took a private shuttle from the airport to Riu Palace Bavaro. Four transfers were booked on-line thru Dominican Airport Transfers total $94.00 R/T. It took 25 minutes to arrive at the resort (another only way to go). Riu Palace Bavaro is very modern. The lobby and main bar is very pink and closed in. The restaurants serve excellent food only times for reservations are 7 or 9 pm. Rooms are decorated in purple and very open. We did have to change our room it smelled very musty. Apparently anything on the first and second floors have the same odor except for the restaurants. We did take advantage of visiting the other Riu's since we stayed at the Bavaro. Bavaro seems to be the biggest but Riu Palace had lunch on the beach and seemed more lively. The beach was gorgeous only thing you had to find a palm tree for shade no huts at the Riu's. We definitely had a great time but we all agreed we like staying at a resort with the Caribbean atmosphere. The Riu Palace Bavaro was very clean (minus the musty smell) but we like the other resorts in the past better. We will be in touch when we decide where and when we are going next year. Food: eh, what can you expect when they cook for the multitudes. A+ for presentation, A+ for variety, my goodness, and some of it was tastey but most was somewhat bland. The dinners in the two restaurants we tried, Krystal and Taino, were really good. Entertainment: there was a Michael Jackson impersonator, awesome! A violinist who was great, and the dancers were very good too! 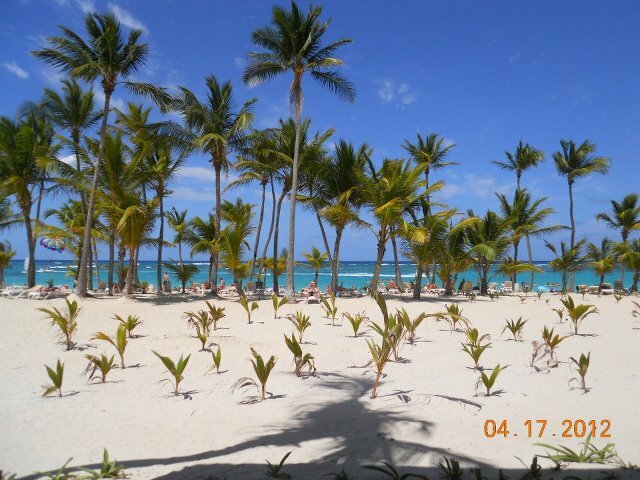 Would you return: we like to try different places each time, but this resort and Punta Cana were awesome. I loved that the water there, so similar to that in Aurba, but there were waves. Love! How did you find our service? you helped us book a trip to Aruba in 2009. We were referred by a friend.